Deacon Paul M. Hilko, 79, fell asleep in the Lord unexpectedly while on vacation with his beloved wife Lorraine and friends on November 12, 2018. Deacon Paul was born and raised in Passaic, NJ, the son of the late Prof. Michael P. Hilko, well known long-time choir director at Saint John the Baptist Church, Passaic, NJ. Deacon Paul’s life was one of service. Growing up in the Carpatho-Russian tradition, he learned both its spiritual and cultural traditions and mastered its sacred music in writing and singing. A humble man of God-given natural talent, he excelled in the art of singing Prostopinije (Plainchant), a traditional form of liturgical chant unique to the Carpathian regions. He served as choir director for some 30 years in Carpatho-Russian parishes in Passaic and Rahway, NJ and at Saints Peter and Paul Russian Orthodox Cathedral, Perth Amboy, NJ. After serving in the Army, he then attended Lincoln Tech Institute in Scotch Plains, NJ, at which he later taught. In 1964. he married the former Lorraine Servas, who would give birth to two beautiful daughters, Eugenia “Gina” and Deborah. Upon his retirement from teaching, Deacon Paul and Lorraine relocated to Port Saint Lucie, FL in 2003 and began attending Saint James the Apostle Church. After five years serving in the choir at the parish, he sensed the call of God to the diaconate. 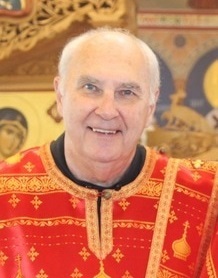 In 2008, he was ordained by His Eminence, the late Archbishop Dmitri at Saint Seraphim Cathedral, Dallas TX. He went on to serve 10 years as deacon at Saint James Church, where he was known as a friendly, faithful, fun loving person. He will be best remembered for his commitment to Jesus Christ, the Orthodox Church and his wife and family. He was a humble, Spirit-filled man of God who served Christ and His Church with all his heart. In addition to his wife, Deacon Paul is survived by their daughters Eugenia “Gina,” Deborah and her husband Tim Constantine, and grandchildren Morgan, Ronnie, Jamie and Timothy. Visitation will begin at Saint James the Apostle Orthodox Church, 2201 Airoso Blvd., Port Saint Lucie, FL at 6:00 p.m. on Monday, November 19. A Panikhida will be celebrated at 7:00 p.m. Funeral Services will be celebrated at the church on Tuesday, November 20, at 10:00 a.m. A repast will follow. Interment will be at Veterans Cemetery, Lake Worth, FL at 1:15 p.m. on Wednesday, November 21. May Deacon Paul’s memory be eternal!